On Monday I completed a good swim in the pool at the university. A reverse ladder ( 600/500/400/300/200/100 ) with increasing intensity. I also swam 200 yards in between sets as a cool down - 3000 yards including warm up and cool down. Lunch called for another 8 x 1/2 mile intervals with 60 seconds recovery. Two weeks ago I did this work out at 9.2 MPH on the treadmill - I upped it to 9.3 MPH - just a tiny bit faster. On the last interval my heart rate average was about 4 beats less than 2 weeks ago. I am seeing progress. So yesterday was the race report - today is the stats - the nitty gritty. I improved by 3.8% including the 3 minutes for the swim. I did, infact improve in the swim - just the distances were not the same. Last year I was about 2 1/2 minutes behind my friend Mike - this year only 30 seconds. And I was 4 minutes behind my friend Chris and this year only 2 minutes - Chris is very fast - like 24.9 MPH on the bike fast. Mike was 16% faster than me last year and only 2.6% faster this year while Chris was 38% faster than me last year and only 12% faster this year. My swim was much improved. 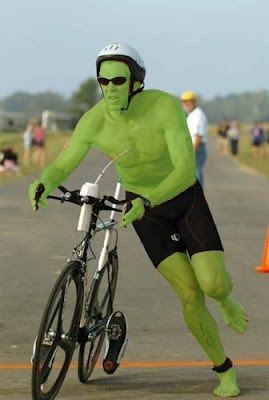 If you remove the swim than the inprovment for the bike, run and transitions was 7%. On to the bike - well 6 minutes improvement on the dot - a 9.3% improvement from last year - 2 MPH!!! - and I did not feel drained or spent when I dismounted. On the contrary I wished that I could have pushed harder. On the run I was 1:58 minutes faster - this was a 4.3% improvement. This is also where I lost the most ground. I really need to work on the mental side of this equation and push myself harder. I have never had trouble in this area - I am not sure what gives. I get to test myself again this weekend! Speaking of Chris - here is a picture of him from a race last year - You do not want to get in his way - he is an animal! Looks like you really had a pretty amazing race! Congratulations, the improvments are impressive! Congrats on all your improvements from last years race... keep rockin'!